Small bright green serrated leaves and small white flowers, much loved by bees. Fresh leaves and flowers can be used in salads, stuffing or sauces for poultry or fish. Great for a lemon flavor without using lemons. Wonderful for summer teas. Medicinal. Shrub. H:60cm W:spread. 12cm, 17cm. • Regular clipping is necessary to promote a bushy plant and control spread. • Avoid a shady area as the plant will become infected with fungal diseases during the raining season. • Attracting Beneficial insects:Outstandingly attractive to BEES, so plant where bees are needed to pollinate other flowers. • Plant it around beehives and rub on beehives before introducing a new swarm. • Custards, Fruit salads, Fruit drinks, Soups, Sauces, White sauces for fish, Herb Vinegars, Mayonnaise, Sauerkraut, Jellies, Wine cups. 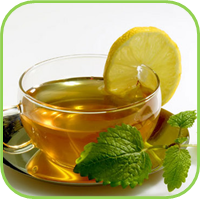 • Tea: Use leaves, light lemon flavour. • For a soft lemon fragrance in Potpourri and Herb pillows. 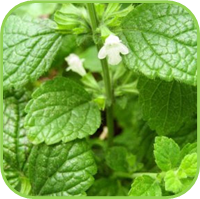 • Use a strong infusion with bathwater, as a facial steam and as a rinse for greasy hair. The London Dispensary , in 1696: "Balm, given every morning, will renew you, strengthen the brain and relieve languishing nature." 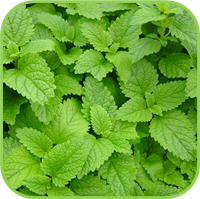 • Recently a Japanese research group isolated 6 major antioxidant compounds from Lemon Balm, one a new compound about 10 times as potent as vitamins C and E.
• Insomnia: Combine very well with Valerian. • Grave's disease - inhibits the receptor binding and biological activity of imunoglobulins in the blood of patients with Grave's disease - a condition resulting in Hyperthyroidism. • Shingles - external and internal (Herpes zoster). • Anti-bacterial / viral: ear infection. • Antihistamine properties - allergies. • Mild vaso-dilation of peripheral vessels - acting to lower blood pressure, in combination with lowering stress and muscle tension. • Reduces muscle pain, cramps. • Infuse for 10 - 15 min. • Take up to three times per day. • Take a handful of chopped leaves and make an infusion in boiling water, allow to cool and soak area around plants infected with red spider mite.